During the upheaval of the late '70s/early '80s punk days, there was a real changing-of-the-guard feeling that led many groups of the time to cover classic oldies from the sacred rock 'n' roll canon in an irreverent (if not downright disrespectful) fashion. One of my recent obsessions is to to collect as many of these as I can find. Thank God(zilla) for this blog - this is now not just some obsessive/compulsive behavior - it's a blog post! I'm part of the New Media, not just a weirdo spending his free time making obscurely-themed cassette mix tapes! And the result: strange, funny, experimental, pop, sometimes just stoopid ridiculous, unpredictable wonderfulness - this stuff's more punk than punk. I'm pretty sure I got some of these tracks off of blogs like Egg City Radio and Mutant Sounds, so thanks to them, and whoever else needs to be thanked. Part two coming at ya soon. MusicForManiacs Guest DJs On "Stray Pop"
Stella has been hosting the show "Stray Pop" on Los Angeles' KXLU for over 30 years, and has interviewed a who's-who of punk/alt rock royalty. So for my appearance last year, I brought up a passel of punk-related weirdness, e.g. 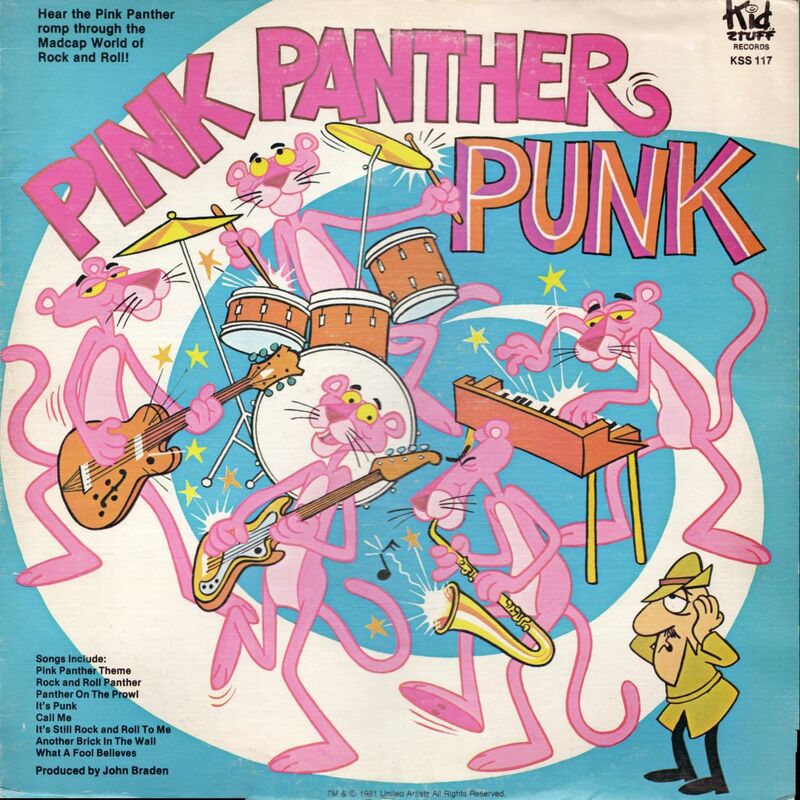 lounge-y, and foreign/ethnic covers of punk classics, punk songs performed by children, animals "singing" death metal, and, yes, a song from "Pink Panther Punk" (an album I got from Way Out Junk). 75 minutes of such nonsense! This happened back in August of last year, but took so long for me to post here cuz I had to wait to get a tape of the show from Stella and edit it 'n' stuff. Yes, a tape. Expect hiss and all that good stuff. This is our third and final look (part one, part two) into the most impenetrable culture in the world - so impenetrable that even these three albums we're offering are just what they want you to hear. Who knows what's going on in the hinterlands. Our man from kitschstortion who sent us this music from who-knows-where (I have no idea how to get North Korean music apart from actually going there) says about today's album: "All songs are versions of the unofficial North/South Korean national anthem "Arirang." Maybe so, but there's a lot of musical diversity here. Certainly doesn't sound like one song played over and over. 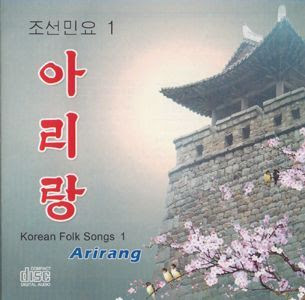 Korean Folk Songs - "Arirang"
If you're as fascinated by this strange, lost world as I am: "Here is another article regarding Pyongyang pop. Also, this youtube channel has a great deal of material shown on the DPRK television station (KCTV) in Pyongyang, including live performances, news reports, and... comedy shows. Note: the account holder is a DPRK apologist; there is a small and uneasily penetrated community of them online." Thanks again comrade, er, kitschstortion! 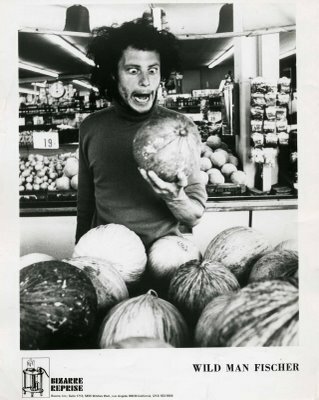 Damn, we've been losing too many strange/outsider greats lately - in the last six months or so, Captain Beefheart, Zoogz Rift, and now Larry "Wild Man" Fischer have died. Fischer was the paranoid schizophrenic Frank Zappa introduced to the world in the late '60s when he discovered Larry walking down the Sunset Strip hollering his songs at the top of his lungs. He was 66, way too young, but he had heart problems, and a difficult life. Fun-To-Know Fact: Rhino Record's first ever release was a single of Fischer bellowing out acapella "Go to Rhino Records/on Westwood Boulevard!" Apparently he used to hang around the now-closed store all day. Would there have been a Rhino label without Fischer? PCL Linkdump has a great post: links to the documentary about Fischer that came out a few years ago, and two whole albums for your downloading pleasure, including an early Zappa-era one, "An Evening With Wild Man Fischer", and one recorded with Smegma in 1975 when those infamous crazies were still in Pasadena in the Los Angeles area before they absconded to Oregon. When I first wrote about this post, I said that the Smegma album "features a fantastic 15 minute destruction of Gladys Knight & The Pips' "Midnight Train to Georgia." Kill Your Merry Go Round: featuring Wild Man Fischer's "Merry Go Round" and "The Wild Man Fischer Story," Lou Reed "Kill Your Sons" (inspired by Reed's teenage shock therapy treatments); C Dott "Merry Go Round"
Kumbia Queers are an all-lesbian Latin American band that cover punk, New Wave, heavy metal, and pop classics in the style of Columbia's great gift to the musical world, cumbia. They change the lyrics to reflect their interests, e.g. : Madonna's "Isla Bonita" becomes "La Isla con Chicas" ("The Island of Girls") and Black Sabbath's "Iron Man" is now "Chica de Metal," that is: "Metal Girl" (or "Chick"). Punk classics. 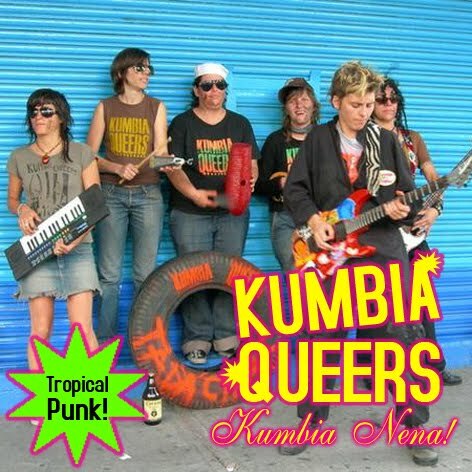 Cumbia style. With lesbian lyrics. Does it get any better?! Well, it could get a little better. Over the course of the entire album, it's apparent that their singing is merely okay, and that they favor the same tempo throughout (some songs could use a little speeding up.) But when that "Iron Man" riff slams down, joined by Latin percussion and cheezy keyboards, all is forgiven. I usually update this blog every few days. It's been weeks since my last post, but I think I've got a pretty good excuse: I was sick to the point of (temporary) (I hope) madness. Two trips to my doctors' office, two visits to the emergency room, a high fever that ran for weeks, delusions, hallucinations, fever dreams...welcome to hell, enjoy your ride! This is going to sound like a joke or something, but I really was tortured one restless night by a reoccurring punchline made by comedy writer Andy Breckman on his WFMU radio show "7 Second Delay": "Is this going to be a long story?" I don't remember what the set-up to the joke was, but Breckman's voice delivering that line kept bouncing around my head like a pinball in a pinball machine. I know this sounds funny, but I thought I was going nuts. 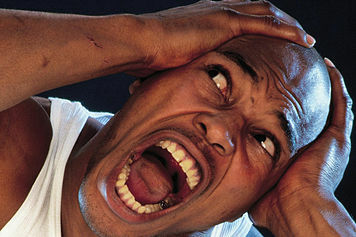 I was also tormented for what seemed like several days by a song from my daughter's favorite show, "Yo Gabba Gabba!" Excellent kiddie fare, but I couldn't get the song out of my head, even deliberately trying to replace it with another, more innocuous one by humming something else whenever the bad song came back. 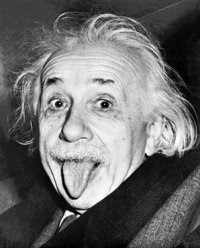 After taking medication for a headache that left me unable to sleep and clutching my head like a Joan Crawford melodrama, I suffered an allergic reaction that had me sticking out my tongue as far out as it could go. Painful, tho it probably looked kinda funny, like Gilligan after a witch-doctor put a curse on him. This was alternated with my jaw clenching down so tight I couldn't open my mouth, and had difficulty breathing. Which did not look funny. Scared the poop out of me and my wife. This is what my wife told me, as I don't remember most of these episodes. I'd always thought of the mentally ill - those poor souls pushing shopping carts down the street, mumbling to themselves - and folks like me as being poles apart. It's pretty alarming, then, to find how quickly and easily I slid into a li'l bit o' madness. It's been over three weeks since it started and lemme tell you, am I glad to be here. I appreciate simple things like a good nights' sleep and eating solid foods. I'm not 100% percent, but, as the doctors never could come up with a diagnosis, I'm just assuming I'm getting better since my symptoms have largely disappeared. This song Grant Hart wrote for Husker Du in 1984 for their classic "Zen Arcade" album came to mind on more than one occasion during this period: "What's going on...inside my head?!" On the positive side, I've lost weight (The Amazing Mystery Illness Diet!) And I will one day return to blogging. See ya soon.